A SINGLE piece of paper doesn't make much of a bomb. A single drop of water doesn't make much of a dent in a rock, either. But a constant drip of water will cut a rock in two. 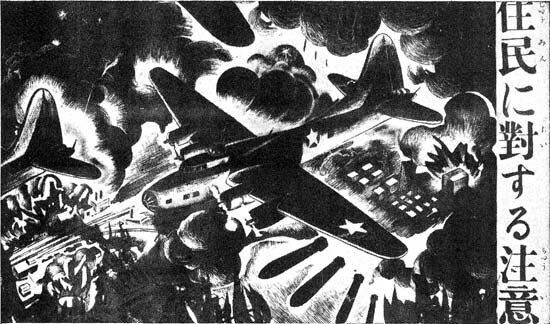 And the millions of leaflets we are dropping over Japanese territory are cutting into the rock of stubborn Jap resistance-cutting down the number of Japs against us. 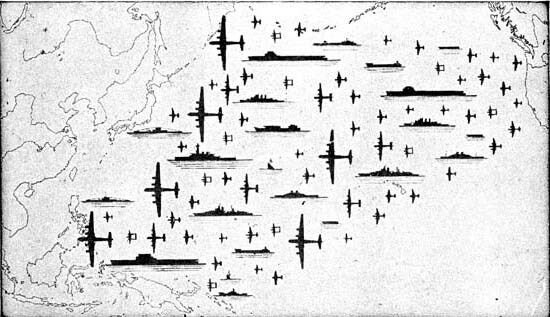 Navy carrier-based planes and the Army's Superforts are dropping millions of these "paper bombs" along with explosive and incendiary bombs over the Jap homeland and his diminishing island holdings. The leaflets aren't intended to kill; but by constant suggestion, infiltration, repetition they eat away at a Jap's will to die for the Son of the Sun. Part of a comprehensive campaign by the Psychological Warfare Section of CincPac - CincPOA, the leaflets are dropped in quantities that reach 500,000 to 1,000,000 a day. In appearance they resemble the gaily colored labels on those packages of paper-covered firecrackers we used to get. Various appeals are used, but they all add up to one idea: "Your fight is hopeless; give up the futile struggle while you can." 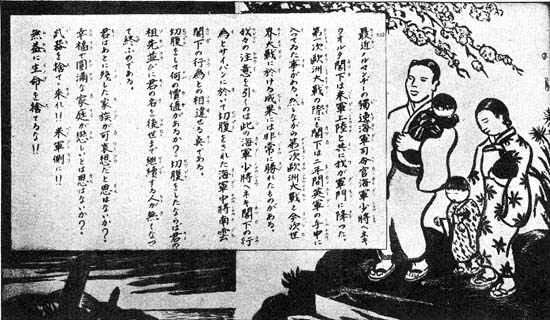 The leaflets - parts of five of them appear as illustrations with this article - make two broad attacks on the Jap's self-confidence and patriotism. First, they emphasize our superior military might; second, they show the Jap fighting man that he's being sold down the river by ruthless and selfish leaders. 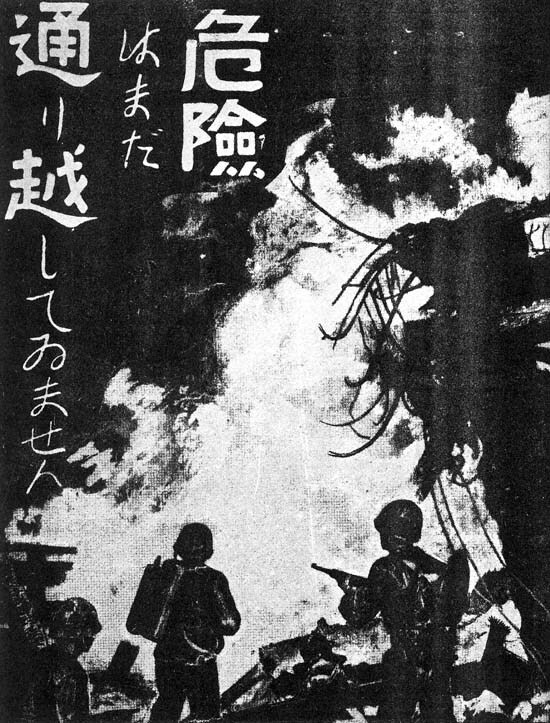 "THE DANGER IS NOT PASSED," this leaflet told civilians on an invaded Jap island. "American forces already have landed . . . and have made excellent progress. Most of the civilians who stayed in the path of the onrushing army were killed because of their own foolishness . . . Shells and bombs cannot tell the difference between soldiers and civilians . . . The American forces have absolutely no intention of shooting at you." "You have already felt the power of our Navy during the bombardment but you have had only a brief experience with American power. More ships, more planes, and more supplies are on the way-Your navy, too, has been driven off and dares not oppose us. Your resistance is futile. Lay down your arms . . ."
After the surrender of Nazi Germany, millions of leaflets carried President Truman's warning that all the Allied might was now being shifted to the Pacific. But just in case the Nip soldier thinks - as his war lords would have him - that a religious fighting spirit can win over ships and tanks, another leaflet asks: "Do you believe spirit alone can win the war? If so, why do you complain of shortages of weapons, build air-raid shelters and armor your tanks? If spirit alone can win, why were you pushed back from the coast?" 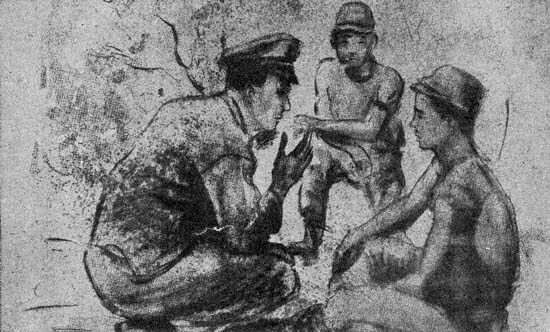 "AN AMERICAN OFFICER was speaking to two Japanese soldiers who came over to the American forces on Guam," says the text on the back of this leaflet. "The two soldiers expressed their thanks for the excellent treatment they had received: ' . . . We were afraid to come over to you. We thought you would kill us. We came only when there was no more hope.' Don't wait until our fierce artillery fire and bombs crush you beyond all hope . . ."
During the battle of Okinawa residents of the island received a brightly colored pamphlet which said, "Time and time again, you were told that the American fleet was destroyed and the American air force had suffered huge losses on every operation. If what you were told is true, how do you explain: That American forces have been victorious at Makin, Tarawa, and in New Guinea, the Solomons, Saipan, Tinian, Guam, Palau and the Philippines since November 1943? That land-based and carrier-based planes have made heavy attacks on Taiwan and the Ryukyu Islands, and have made Manila harbor a shambles? That Honshu is bombed several times a week by large numbers of giant planes? How do you explain the presence at this very moment of twice as many American ships in the vicinity of this island as there are in the entire Japanese Navy?" The Jap soldier is constantly reminded of his inadequate war equipment. His officers and the deceitful military leaders, he is told, have failed him, but are willing to let him die in order to further their personal ambitions. "NOW THAT AMERICAN FORCES are invading your island, your lives are in danger," the text of this one points out. "Beaches will be bombed and shelled in order to weaken the Japanese Army and prepare for American troop landings. However, bombs dropped from planes and shells from battleships may land anywhere. Civilians who remain in coastal areas will be destroyed ... If you value your lives, follow these instructions . . ."
One leaflet points out that Occidentals attach no stigma to surrender. Another declares that eventually the entire population of Japan will be forced to surrender and that this will remove any stigma attached to those who surrendered earlier. Continuing on this theme, one message tells military personnel that futile death is a violation of the traditional Japanese obligation to carry on the family line and serve one's country in the future. Paralleling the efforts to remove the stigma of surrender, many leaflets picture by word and photographs the good treatment Americans give captured soldiers and civilians. Although these leaflets are pouring down on the Japanese day by day, it is still too early to judge the effectiveness of the "paper bombs." However, this much was observed on Okinawa, where specific appeals to get out of the battle areas, were addressed to civilians : most old people, women and children complied. "SINCE DECEMBER 8, 1941, the United States has built more than 33,000,000 tons of shipping," is the message in this leaflet. "You who are on this island know how little shipping Japan has. Since December 8, 1941, the United States has built more than 171,000 planes. You do not have even enough planes to protect you here . . . Come over to us." Also, now, for the first time in the long Pacific battle, Nip soldiers are coming forward in numbers to surrender (see photographs on next two pages). Previously an isolated Jap might give up, but rarely would a group surrender together. Now, even that has happened - on Okinawa, on Luzon, on Guam. On one island recently a Jap doctor and 57 corpsmen came forward voluntarily. The literal translation of this is: "Don't rest your ladder against a cloud." What it really means is: Brother, why don't you smarten up! "RECENTLY Rear Admiral Walter Hennecke, the German naval commander in Normandy, was captured by American troops . . . In World War I, Admiral Hennecke was in British hands two years," says the text. "Yet, his record in both wars is excellent. We note . . . the difference between Admiral Hennecke's conduct and that of Admiral Nagumo who committed suicide at Saipan. Of what value is suicide when it leaves a man without sons?"